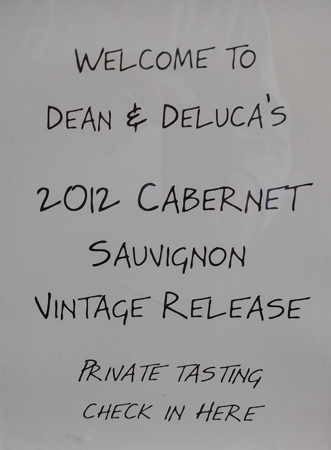 Shortly before my recent trip to Napa Valley I received an invitation to the Dean & Deluca 2012 Cabernet Sauvignon Vintage Release Wine Tasting. This tasting featured some of the top 20 vintage Cabernets made in 2012 by Napa Valley vintners. The invitation came from my friend Kerrin Laz, then Wine Director at Dean & Deluca. I say “then” as Dean & Deluca has since been sold, and its wine list program and some of its other wine-related programs have been discontinued. This situation has allowed Kerrin, with the assistance of Dean & Deluca, to start her own company: K. Laz Wine Collection…more on that later. If you are a Napa Valley Cabernet lover, as I am, you couldn’t have been at a better tasting than this. It was delightful. My pals Sean Larkin of Larkin Wines and Didier Loustau of ToutSuite Social Club (and the former senior wine buyer for Dean & Deluca) accompanied me to the tasting. The event was supposed to be limited to 50 people, but the crowd seemed larger than that. Regardless, everyone had a wonderful time and tasted some great wines. I had the opportunity to meet some new folks which was great fun as well. I met John and Stacy Reinert who have started Brilliant Mistake Wines and will release their first vintage shortly. I have heard from others who have tasted the wine that it is really good. I am looking forward to tasting their first release. 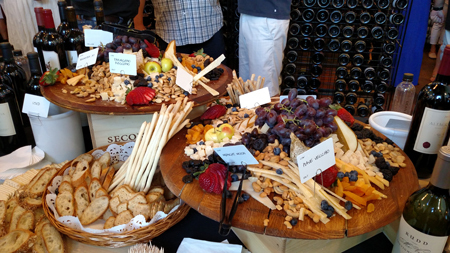 The spread at the Dean & Deluca wine tasting. 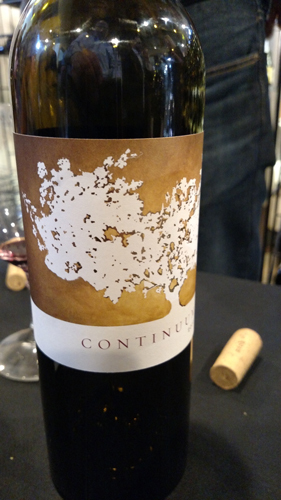 Tim Mondavi stopped by to greet people at the Continuum Estate table. It was a pleasure to meet him and taste their wine. As you’ll notice below, it was on my list of top wines of the tasting. 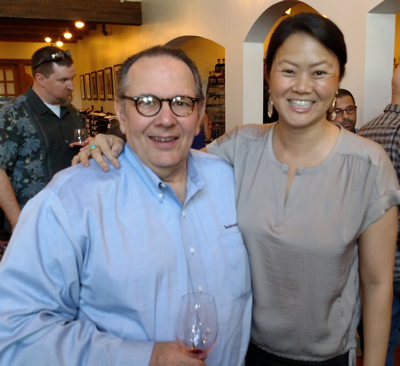 Finally, I reconnected at the tasting with Roy D. Chapin IV of 4 Winds Winery. Sean Larkin and I had dinner with Roy and Kerrin Laz on the prior Wednesday evening. I also had the pleasure of meeting Roy’s mother and business partner at 4 Winds Winery, Jane Chapin, who was a delightful lady. This is the first release of this new winery and it’s a beauty. The winery is located on a 100-acre plus site in the Stags Leap District of Napa Valley. Powerhouse winemaker Thomas Rivers Brown is 4 Winds’ winemaker. The grapes for this Cabernet were sourced from neighboring vineyards. The color of the wine was a lush deep purple. On the nose there were wonderful hints of black fruit, cedar and vanilla. On the palate this wine was dense and chewy, and delivered layers of black cherry and licorice with hints of spice. The finish was of a good length with soft tannins and a good aftertaste. This wine is young and will mature nicely with some cellaring. The wine can be purchased through the winery’s website. This is a blended wine consisting of 78% Cabernet Sauvignon, 11% Cabernet Franc, 6% Merlot and 5% Petit Verdot. The wine is produced by Tim and Marcia Mondavi and their children. According to their website the winery was founded in 2005 with the 2012 vintage being the first wine with 100% of the fruit coming from the estate vineyard. The color of the wine was an impressive deep purple/plum color. On the nose the wine had hints of black fruit and espresso. On the palate the wine was full bodied with flavors of black cherries, graphite and mild spice. The finish was of a good length with sweet tannins and a very pleasant texture. You can purchase directly from the winery via their mailing list. Go to the website to sign up. 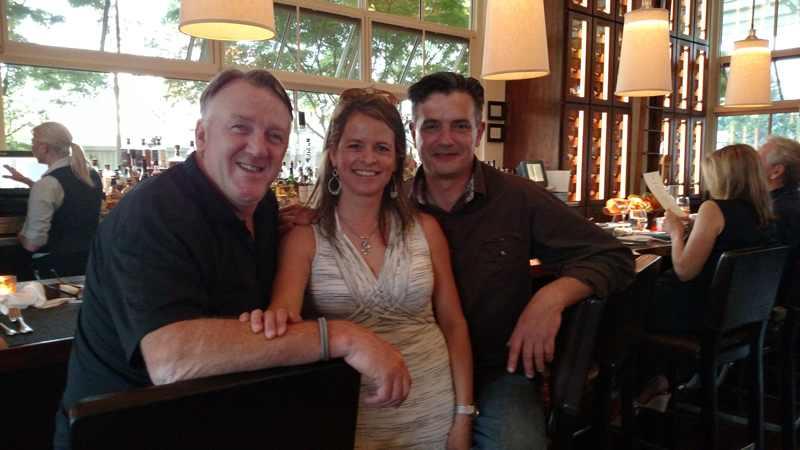 Sean Larkin, Kelly Peterson of Switchback Ridge and Didier Loustau at Press restaurant. I am a long-time fan of Switchback Ridge Wines and have multiple year verticals of their Cabernet in my personal wine cellar. Working the tasting table at the event was Kelly Peterson, Managing Partner at Switchback Ridge. It was fun to chat with Kelly at the tasting and again later at dinner. The 2012 Switchback Ridge is 100% Cabernet Sauvignon and was made by the impressive winemaker Robert Foley. In the glass the wine was dark red in color. The nose produced aromas of cocoa and sweet black fruit. It was silky on the palate with flavors of black cherries, cedar and coffee. The finish was balanced and long with good tannins, mild warmth and provided a lingering excellent aftertaste. The wine is available from the winery website or search for it on the web. The wine is normally priced around $80.00 to $85.00 per bottle. This was an enjoyable tasting event and I am certainly glad I was able to attend. After the tasting Sean, Didier and I headed next door to the restaurant Press. 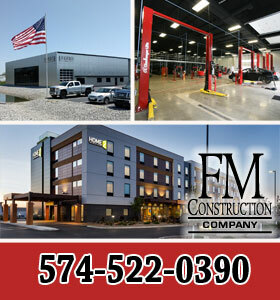 Press was founded by and owned by Leslie Rudd (Leslie Rudd is a long-time friend and partner of my friend and real estate partner Herb Krumsick of Witicha, Kansas.) Press is well known for its support of Napa Valley wines and its wine list features Napa Valley wines exclusively. One of the interesting things about their wine list is that it is a celebration of the heritage and history of the wines of Napa Valley. There are wines on the list dating from the 1950s going forward. 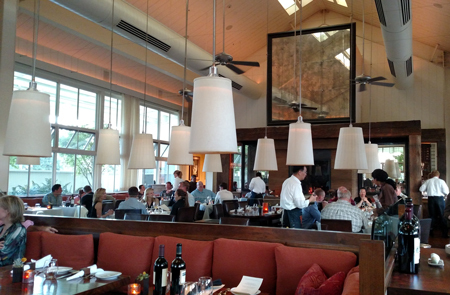 Their list is entirely devoted to Napa Valley wines. The visit to the Press Restaurant, and the meeting and conversation with friends old and new was a great ending to Friday’s events and my trip to Napa Valley. In the near future I hope to give you an update on Kerrin Laz and her new venture K. Laz Wine Collection. But until then you can check out her website. Below are the upcoming programs you might be interested in viewing on our wine country media partners site at http://www.toutsuite.com. ToutSuite programs are always informative and interesting.